Jean was delighted when her oldest son began his studies at Duke University as a pre-med student. But she was baffled and a bit disappointed when he called at the start of his junior year of college to say he was changing his major to foreign affairs and public policy. He’s too honest to be a politician, she thought. Soon after, cleaning the attic, she came upon a box of newspaper clippings Tom began collecting at age seven: articles about effects after the Civil Rights movement; audiotapes of sermons by Martin Luther King, Jr., and speeches of President John F. Kennedy. His decision to go into public policy suddenly made sense. How could I have missed all these years that this was his passion? she wondered. Point: How do any of us miss what everyday interests tell us about our purpose and passion. Principle: I can know what it is I was made to be and do, and I can live out that purpose every day. 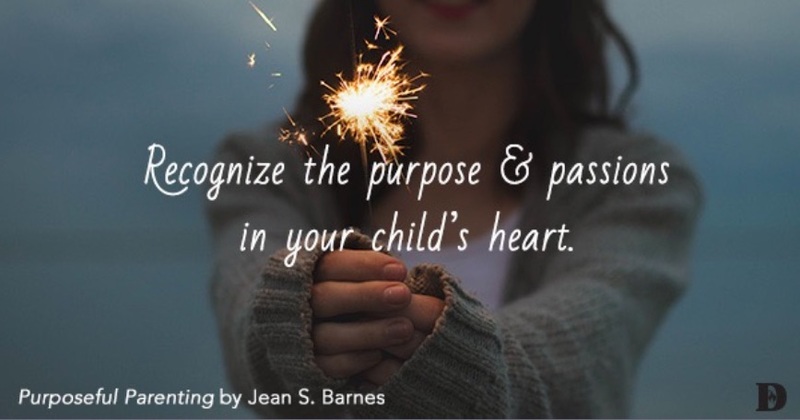 First you help your children know they’re made on purpose for a purpose. God brought your child into this world to accomplish His purpose not yours. God tells us this from the very beginning in the Bible. “For you created my inmost being, you knit me together in my other’s womb. I praise you because I am fearfully and wonderfully made; your works are wonderful, I know that well. My frame was not hidden from you when I was made in the secret place, when I was woven in the depths of the earth. Your eyes saw my uniformed body, and the days ordained for me were written in your book before one of them came to be.” Psalm 139: 13-16. I love how Ken Robinson, PhD and author of The New York Times best seller The Element: How Finding Your Passion Changes Everything describes this. He says you realize you’re made for a purpose when “you’re in your element,” when your natural talent meets your personal passion and you’re doing exactly what you were born to do. There is no greater feeling of satisfaction, nothing else compares to knowing you are being used for God’s purpose.